Some say, that Draco Malfoy, Harry Potters favourite enemy in Hogwarts, is a bad Death-Eater like his father. But I say, that i´m convinced that Draco isn´t just the bad boy, everybody thinks. Just think in his shoes: His father, which he admired since birth is a Deah-Eater. Draco grew up in a rush of "pure Blood" and admiration to the dark lord. He was taught to hate muggle-born witches and wizards and he was taught, that he is something special. Then he came to Hogwarts. And there was a boy, who is even more famous and known than him: Harry Potter, the boy, who lived. Surely, Draco has been said, that he should be friendly th this special boy. His father said him, that Potter might be the new Voldemort. So Draco went to this boy, to offer his friendship, but Harry refused. He rather bacame friends with Ronald Weasley, whose family isn´t really friendly with his own. So Draco just had to envy the boy, who is more popular, than he ever will be. So he wanted to be the best flier under the first-class pupils. But then, Potter was even better in that than him. His envy grows with every thing, Harry can do better than him. Who would not be that pissed of someone, who is even more popular and better in everything than him? So I can understand Draco. He was told to be the best, because of the family honour. And then, there is this guy. No wonder, that he is Potters opponent from now on. He was told, that Voldemort is good for the world of wizardry. His father is a faithful Death-Eater. Finally, he´s just a boy, who is impressionable. 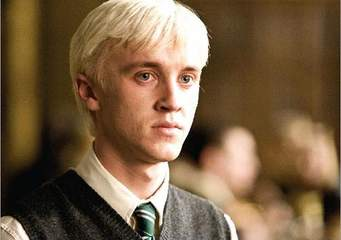 I think, that Draco won´t be that bad, if he was in another family. And don´t forget: In the end, he flees with his family from the dark lord. He can´t kill Dumbledore in the astronomy tower, he was desperate, when Voldemort told him to kill. No, he is not cruel. He is just a poor, pitiful boy, who was led on the wrong way. And one thing, I surely know: He will be a great father for Scorpius. Just because he´s a former Death-Eater, that can´t mean, that he will be forever. He ist a good boy.